I dug up some of my hops and split them. I'm trying them in a new place in the yard to see if they get better airflow out in the middle of the yard versus next to the garage. What hopps are you growing again? Northern Brewer and Willow Creek, which is a neomex. The NB has always done really well for me. Any high alpha/oil hops grow well down here? We're buying a new house and we have some more land than the old house, and i've been wanting to plant my own. Also, really like that trellis design. 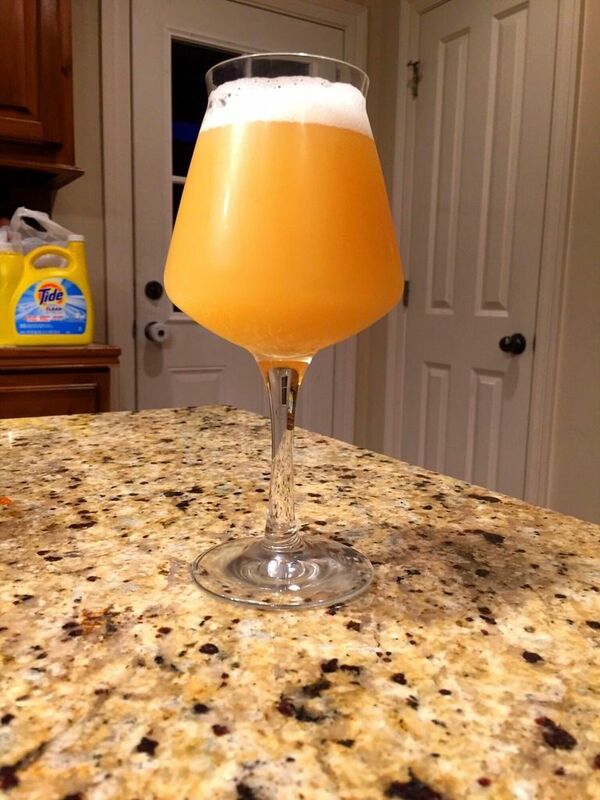 So i kegged my NEIPA with sabro, azacca, and medusa. It's pretty good. I gotta be honest, i prefer galaxy over Sabro. Getting lots of stonefruit in the hop aroma and flavor. I think a Galaxy, Sabro, Azacca NEIPA would be killer. My friend wants to try his hand at brewing a neipa after I recommended a few to him. He has a full setup, but hasn't brewed in a while and has only brewed some traditional german beers and ales. He knows I am interested in brewing and invited me to brew this weekend, provided that I find the recipe as he doesn't know where to start. Was thinking juicy bits would be a good start as local HB stores are more likely to have citra, mosaic, and el dorado as opposed to sabro, azacca, and the other new hotness hops. It looks relatively straightforward, and I was planning to simplify it by not trying to correct water. Thoughts? I think that recipe will get you there. The only changes i would make, personally, is add all my whirlpool hops at once. .6 oz. at 40 min and .2 at 30 min. is unnecessary at a homebrew level. I'm sure this recipe and hop schedule is just scaled down from production level. And for the hops listed as "starting at 5-5.5 plato", just add your hops on the 3rd day of active fermentation. I have a serial downvoter. Oh, a tip. Do your best to avoid Oxygen pickup when transferring to keg/bottle. I made a change for my last NEIPA (i'll post a picture of it in a second) and went from fermenter to keg via the liquid out port of the keg. It seems to have made a difference. The guy who wants to brew this weekend has only ever bottled so avoiding oxygen in the transfer will be tricky. Do you just fill until foam hits the top? The other guy who wants to brew regularly kegs only. Also, any reliable recipes to bottle carbonate? Do you just fill until foam hits the top? Dunno about foam, but if you have a bottling wand, you just fill to the top. The area of the bottling volume displaces enough of an area for adequate headspace in 12 oz. bottles. i woul dalso say that the water chemistry is rather critical for Neipas to get the proper mouth feel. I do appreciate that, however the advice I was given by local HB guys is that our water doesn't need a ton of adjustment. On top of that my local water reports that are available online are pretty rudimentary. No mention of ppm of minerals. Just pH and contaminents. Wouldn't you want to adjust water chemistry to an endpoint rather than blindly? our water doesn't need a ton of adjustment. if that is the case i would just go buy 10 gallon jugs of distilled water from walmart for 10 bucks. and build your water from scratch. but you would need the minerals. if you dont have that then idk what to tell you. When ih ave trained new home brewers, the first big step to improving your beers is going from extract to all grain. And IMO the next big step is Water Chemistry. Nope I'm in central KY. I'm just going off of what i was told. Lol. Good point on the distilled water. Maybe I will try to adjust it. Wouldn't you want to adjust water chemistry to an endpoint rather than blindly? I do. I use BR Water as my base and add my salts there. The recipe you provided has the desired range they use. I use beersmith to determine my water chemistry, but you can also go to brewersfriend.com and go to the advanced water chemistry tool and plug away. And there should be a water report available. Contact a local homebrew club in the area, they may have one. Or do like Ramrod suggested and go RO water or distilled. It is. However, most NEIPA's go 2:1 chloride:sulfate ratio. I don't like NEIPA's that are overly chewy, so my NEIPA recipes are at a 1:1 ratio right now. It's got plenty mouthfeel without muting everything else. Going to brew again Saturday, most likely. I've got a couple sours ready for packaging/fruit, so i need to brew up my first blend batch of clean saison. The 2 sours ready are Generation 2 of my first mixed fermentation sour, and generation 2 of a sour i made with built up wicked weed dregs. Farmhouse Saison #1 has some good acidity and moderate Brett notes. Get some leather/tobacco/cherry notes from this one. The wicked weed batch is a very clean sour with low to medium brett notes. I was thinking about bottling this one without fruit, but i've been wanting to use apricots on a batch, so i think i'll use it here. Going to brew 6 gallons. Ferment it out with Bootleg's Saison Parfait yeast. Once fermentation is complete, I plan to blend 2 gallons of clean saison with 3 gallons of my sour on top of around 8-10 lbs of tart cherries. 1/2 to 1 gallon will be used to top off my Solera. I need to transfer my solera batch to a clean fermenter to get it off of the dregs. Bonus: I get to use the solera dregs for something in the future. 3 gallons of the clean saison will be racked on top of the dregs from the sour that was used to blend. This will become generation 3 of those LAB's/yeast. Any remaining clean beer will be racked into a 1 gallon demijohn, probably with the Solera dregs. So essentially, one batch of clean saison will be used in creating at least 3 differing batches of sour beer. I plan to let the blended sour batch on cherries sit about 6-8 weeks before bottling. During that time, i'd like to brew 5-6 gallons of a Sach/Brett saison. Once primary fermentation is complete, i'll blend with one of the 3 - 1 gallon demijohns of sours and try to recreate a batch i made last year of a brett/sach saison that was blended and then racked on top of figs. I didn't have enough figs when i made it, to be impactful, so hopefully i can get a bunch this year. After that batch, and after i bottle the cherry sour, i'll reserve the dregs in another 1 gallon demijohn. I'll then have to brew another blender batch of clean saison, following the same plan as the cherry batch. But instead of cherries, the Wicked Weed batch will utilize about 10 lbs of apricots.